Short shank, compact, clip-tip handle MAGNA-TIP® with three custom bits for S&W Strain, Windage, Side Plate and Sight attaching screws. Gives excellent control. SPECS: 5-1/2" (14.0cm) overall. 3-3/4" (9.5cm) x 1" (2.5cm) diameter. Kort stamme, kompakt, klipp-tip håndtak MAGNA-TIP ® med tre egendefinerte bitene for S & W belastning, Windage, Side Plate og synet feste skruer. Gir utmerket kontroll. Spesifikasjoner: 5-1/2"(14.0 cm) samlet. 3-3/4" (9,5 cm) x 1"(2,5 cm) diameter. Received this product on time. All screwdriver bits fit my K frame fine. The handle is functional. However, the handle is not hollow, contrary to the online description. It is a short, law enforcement handle, but you cannot store the 3 bits included inside the handle. That will cost you more money. Somewhat deceptive, Brownell's, but not worth arguing about. Maybe I misunderstood the description. Amazed at how fast these got to me. Less than two days. Very good. Perfect set of points for what I need which is adjusting sites, removing screws from the side plates and trying different stocks for my revolvers. They got here fast and I used them furiously. 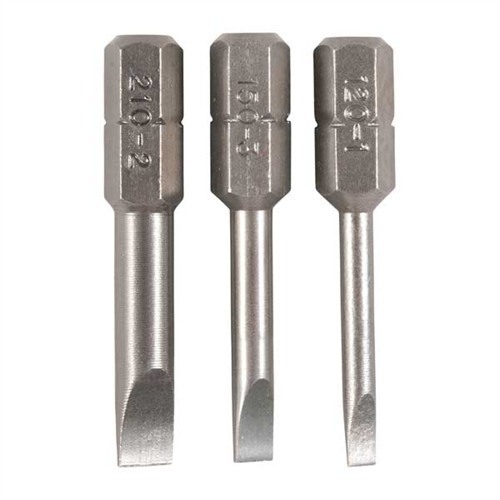 S&W Screwdriver Set 422145700005 Kort stamme, kompakt, klipp-tip håndtak MAGNA-TIP ® med tre egendefinerte bitene for S & W belastning, Windage, Side Plate og synet feste skruer. Gir utmerket kontroll.